I have sold properties that have been purchased as “fixers,” almost entirely gutted and redone, then put back on the market. It’s wonderful to witness the transformation, especially when thoughtfully restored by those with vision, morphing a tired home into one that’s celebrated, all the while carefully retaining some sense of “original” or legacy personality that complements the neighborhood. While these craftsmen often make this process appear easy, it is far from the truth. I am often asked what a seller paid for the property, simply trying to apply some basic math and gauge if their profit is justified, not giving value to the scope of what was involved to renovate the property. I must explain that whatever that original number is means nothing, as in the end, the property will be judged by the market and sell for what it’s worth. 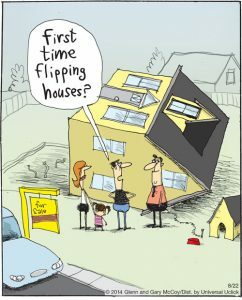 Flipping is defined as when a real estate investor buys houses with the intention of quickly selling for a profit. There is, however, a big difference between a novice house flipper and a professional. What you see championed by a whole host of reality shows on TV, with HGTV making a sport of it, are professionals. I am sure they would admit that it’s more hard work and risk than glamour. With current prices, the initial dollars start building quickly as the typical property acquisition costs is high. In our recent robust market, the demand is strong and therefore, a “fixer” home may be the only entry into the market; the investor is now competing with an end user making it difficult to secure a ‘fixer” at a justifiable price. Price is the beginning; the other factor is time. Flipping homes can take months to get off the ground, including plans that comply with local and applicable building/zoning codes, local design reviews and associated red tape, permits, and inspections. These are all before the first nail goes in. Then comes the labor and materials, as well as other hidden costs including carrying costs (yard maintenance, utilities, property taxes, insurance) even before you get into the selling costs (commissions, title insurance, escrow, etc.). If this is not carefully managed, it can become a money pit. Knowledge is equally as important as it begins with understanding the market and trends. If the market is in a “correction” and you are in the middle of a major project, you may need to scale down your finishes or forgo what you originally conceptualized. Knowledge also refers to construction, knowing systems, and having a network of pre-arranged, reliable contractors to hedge delays. Professionals understand that buying and selling houses takes time and that the profit margins are sometimes slim. In the end, what appears as a fun project or hobby should actually be viewed as a business. Without viewing it that way, you will end up upside down. Kelly Perkins is a realtor with Villa Real Estate.